Individul Project: NPD-NET Component 4: Integration and Regional Adaptation of NPD Roadmap Kick-off meeting Region of Central Macedonia – URENIO Research. 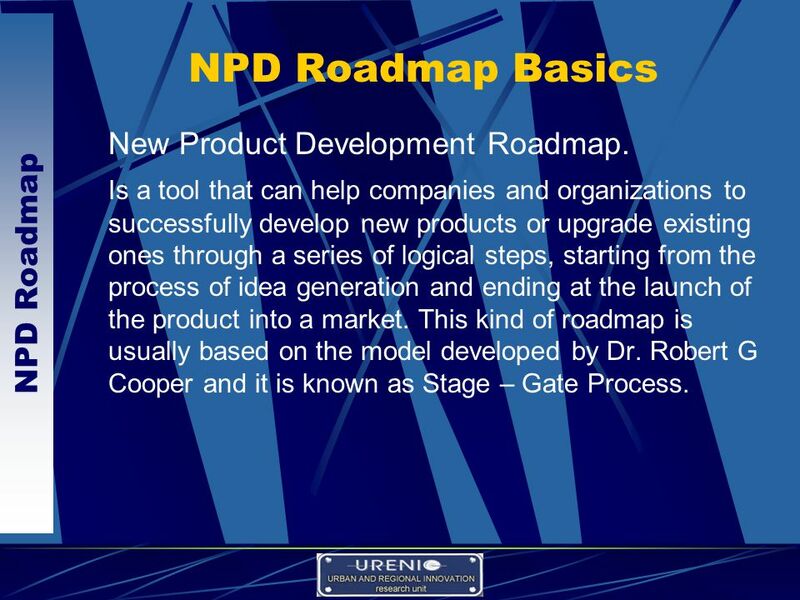 2 NPD Roadmap NPD Roadmap Basics New Product Development Roadmap. 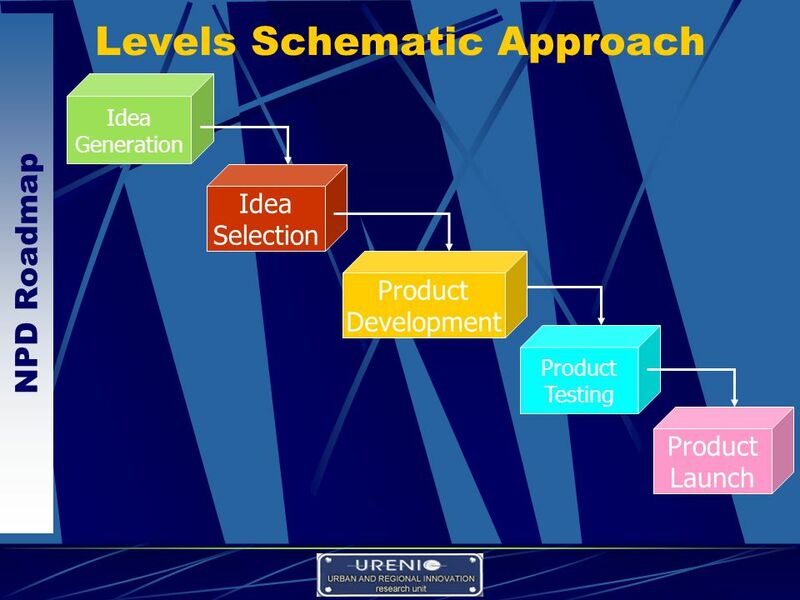 Is a tool that can help companies and organizations to successfully develop new products or upgrade existing ones through a series of logical steps, starting from the process of idea generation and ending at the launch of the product into a market. This kind of roadmap is usually based on the model developed by Dr. Robert G Cooper and it is known as Stage – Gate Process. 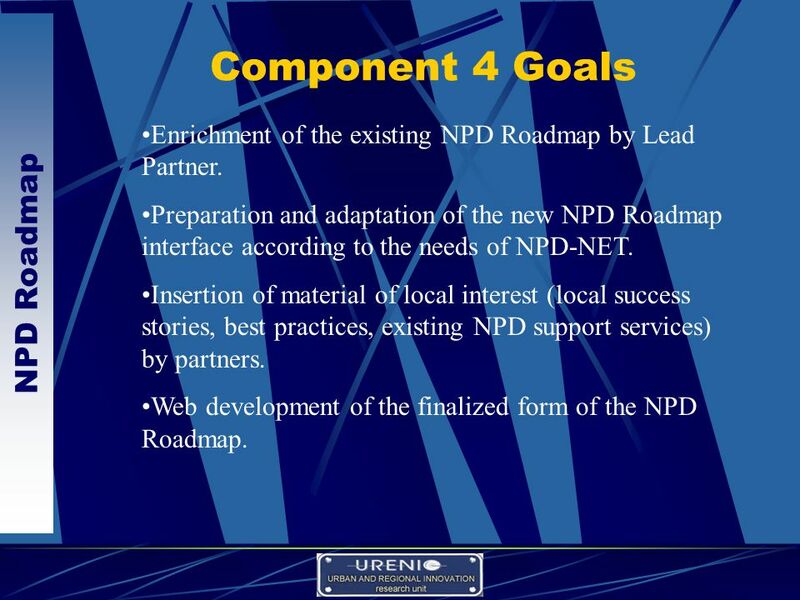 3 NPD Roadmap Component 4 Goals Enrichment of the existing NPD Roadmap by Lead Partner. Preparation and adaptation of the new NPD Roadmap interface according to the needs of NPD-NET. Insertion of material of local interest (local success stories, best practices, existing NPD support services) by partners. Web development of the finalized form of the NPD Roadmap. 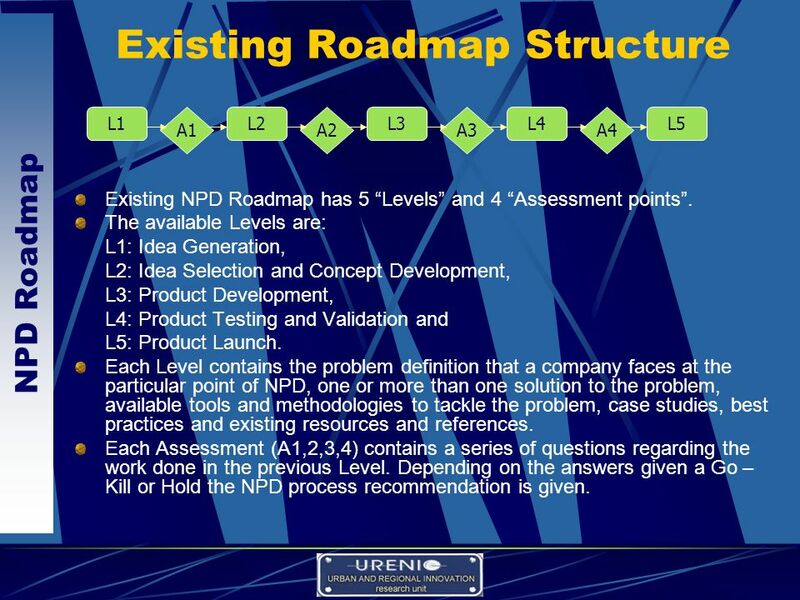 7 NPD Roadmap Level 1. Idea Generation Description: Generation of new ideas There are many techniques and tools Internal & external sources Requires a person who will collect the proposed ideas Solution: Gather as many ideas as possible using the tools available Tools: Conjoint Analysis QFD Brainstorming Competitive intelligence Tools / Techniques to be added: Specific methods of Brainstorming such as “Listing & Mapping”, “Structured and Unstructured Brainstorming” etc. 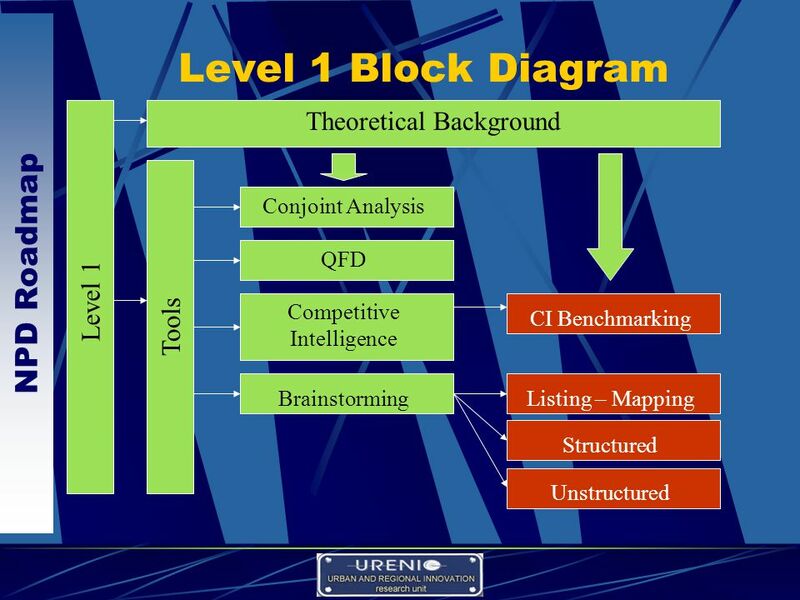 Practical ways of performing CI such as the “CI Benchmarking Tool”. 9 NPD Roadmap Level 2. 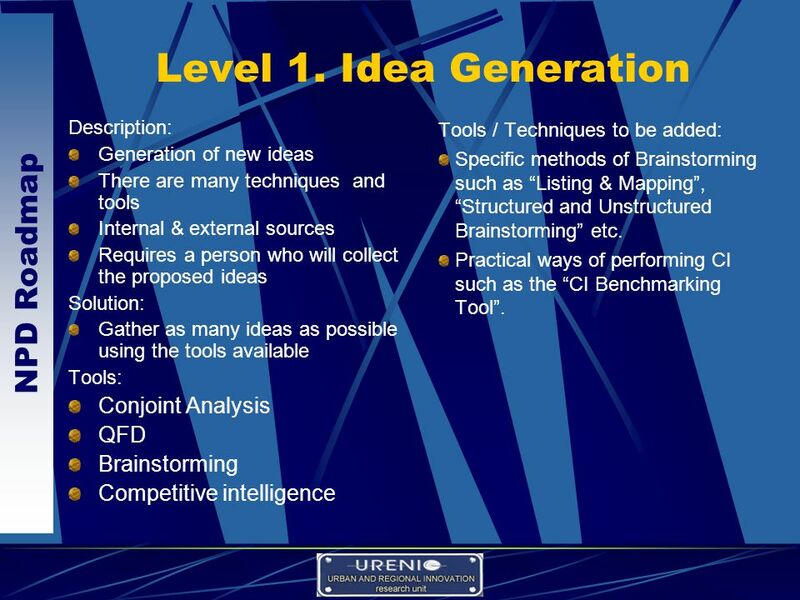 Idea Selection and Concept Development Description: Screening of new ideas vs customer needs, strategic goals, profits – sales. Product concept development. Cross functional team setup. Preliminary development setup. 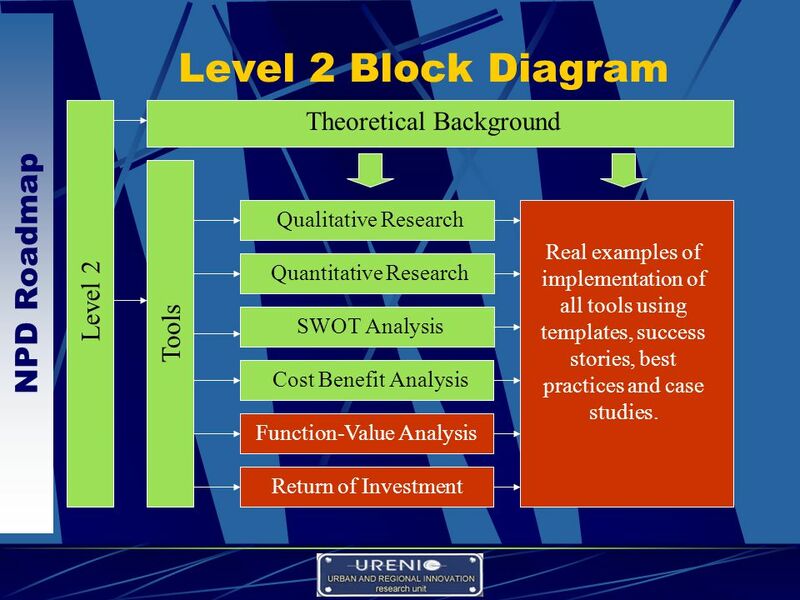 Tools: SWOT Analysis Qualitative & Quantitative research Cost Benefit Analysis Tools / Techniques to be added: Function – Value analysis. Return of Investment prediction – analysis. Practical ways of designing, conducting and analyzing Qualitative and Quantitative Research depending on the size of the company. 11 NPD Roadmap Level 3. 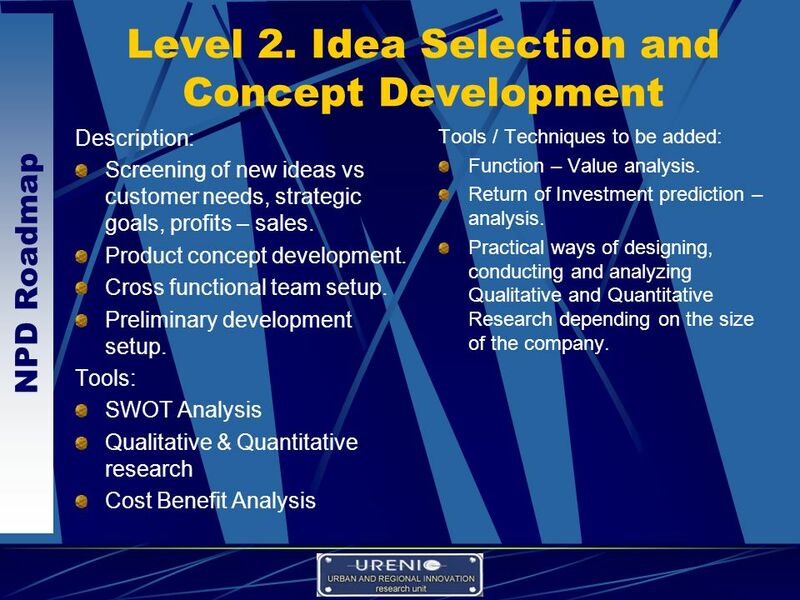 Product Development Description: Develop new product according to product concept Solution: Implementation of the action plan for product development Setup an R&D environment, R&D Management, and locate and implement R&D financing. Design prototypes. Design testing methods. 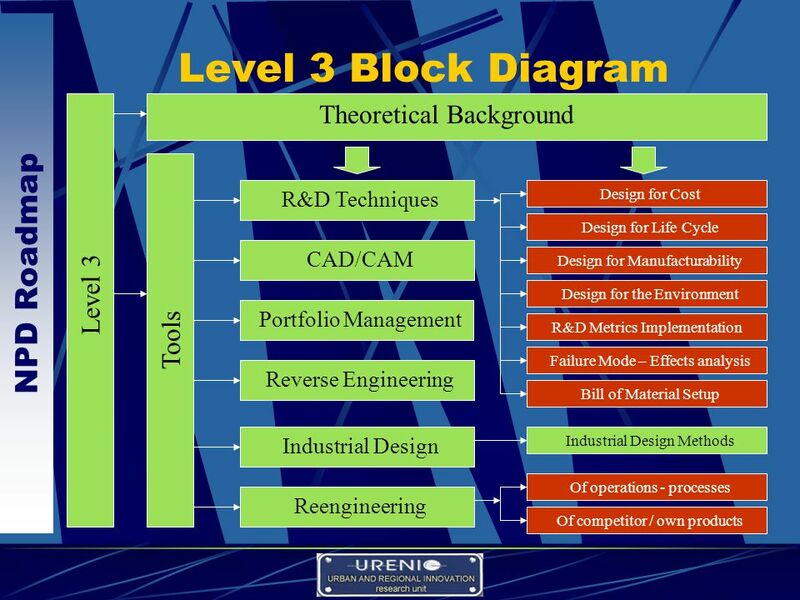 Design – setup manufacturing – production methodology. Tools CAD/CAM Reengineering Reverse Engineering Industrial Design Tools / Techniques to be added: Design for Cost. Design for life cycle. Design for manufacturability. Design for the environment. Implementation of R&D metrics. Implementation of Portfolio management. Failure mode – effects analysis (FMEA). Bill of material management. Outsourcing implementation (statement of Work – SOW). 13 NPD Roadmap Level 4. 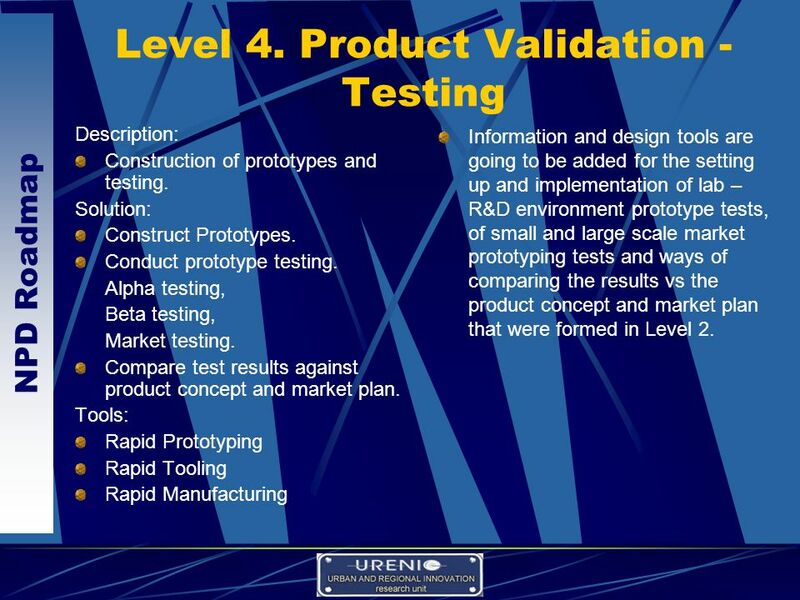 Product Validation - Testing Description: Construction of prototypes and testing. Solution: Construct Prototypes. Conduct prototype testing. Alpha testing, Beta testing, Market testing. Compare test results against product concept and market plan. 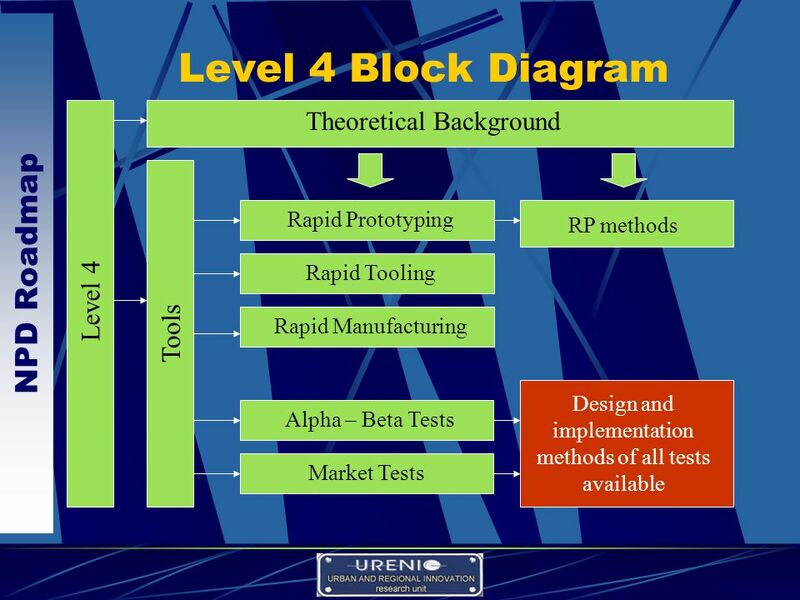 Tools: Rapid Prototyping Rapid Tooling Rapid Manufacturing Information and design tools are going to be added for the setting up and implementation of lab – R&D environment prototype tests, of small and large scale market prototyping tests and ways of comparing the results vs the product concept and market plan that were formed in Level 2. 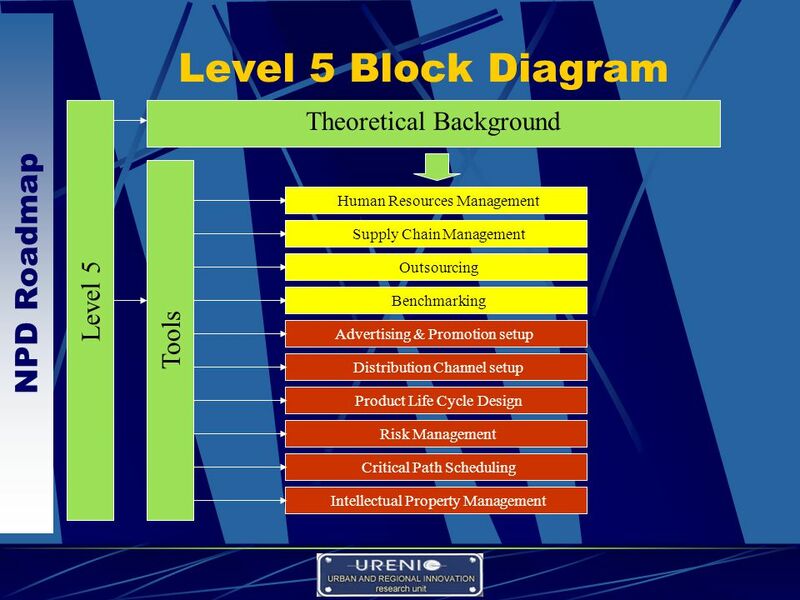 15 NPD Roadmap Level 5. Product Launch Description: Decide where, when, and how to introduce the new product into a market. 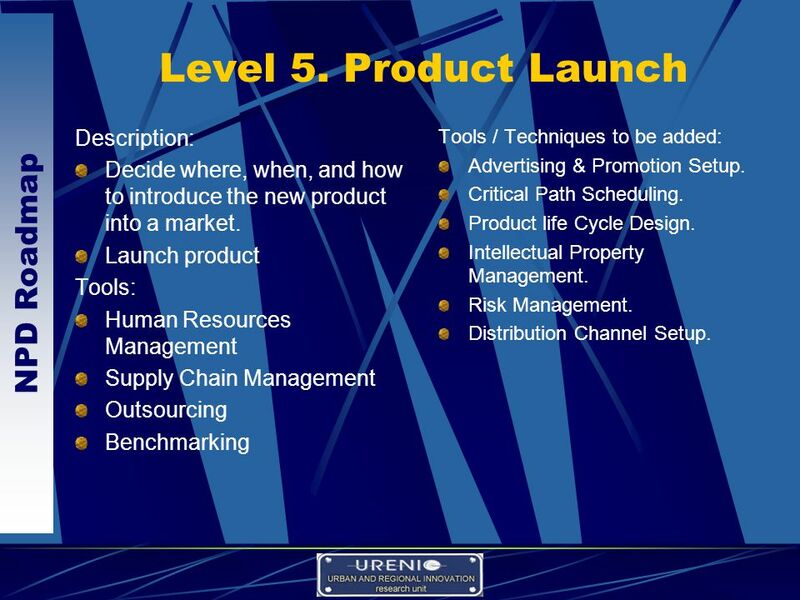 Launch product Tools: Human Resources Management Supply Chain Management Outsourcing Benchmarking Tools / Techniques to be added: Advertising & Promotion Setup. Critical Path Scheduling. Product life Cycle Design. Intellectual Property Management. Risk Management. Distribution Channel Setup. 17 NPD Roadmap Things to Note on the New NPD Roadmap Structure Human Resources Management, Outsourcing, Supply Chain management and Benchmarking were inserted in original Roadmap in Level 5. In the new Roadmap the 1st three will have applications in all Levels. The 4th one will be applied optionally before starting Level 1 and after completion of Level 5. 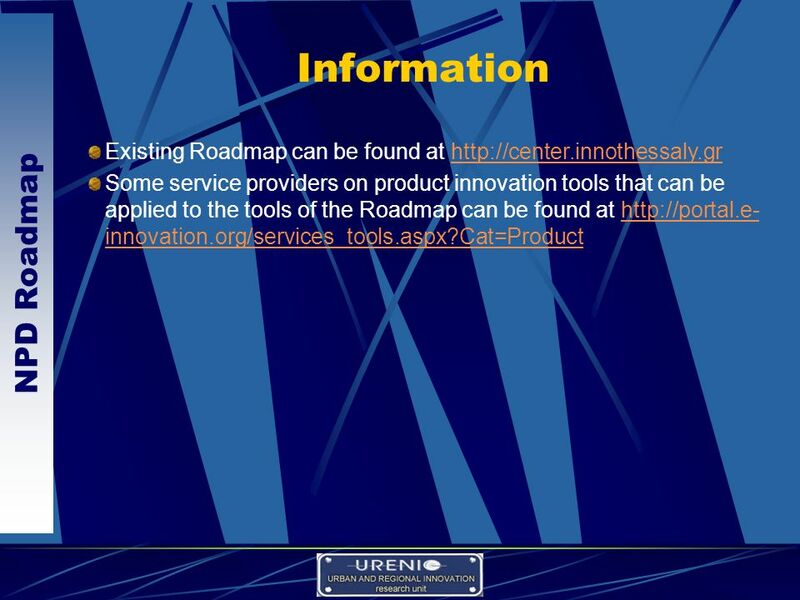 Some of the tools mentioned already exist and some are to be added in the next period of time. 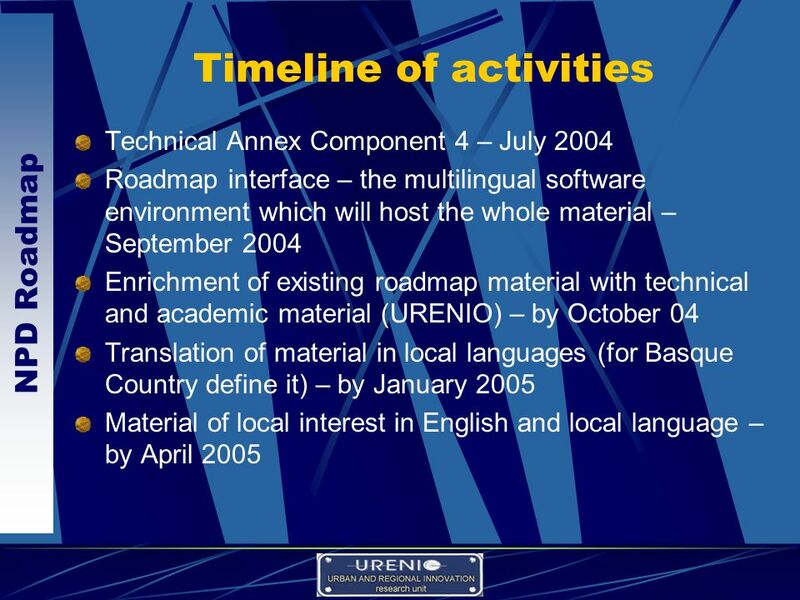 But as the work of component 4 progresses more tools / techniques are to be added depending on the needs and actual applications of the Roadmap on the Local and Regional Level. Component 3 information on both Supply and Demand side can alter the structure of parts or Levels or whole Levels of the Roadmap. 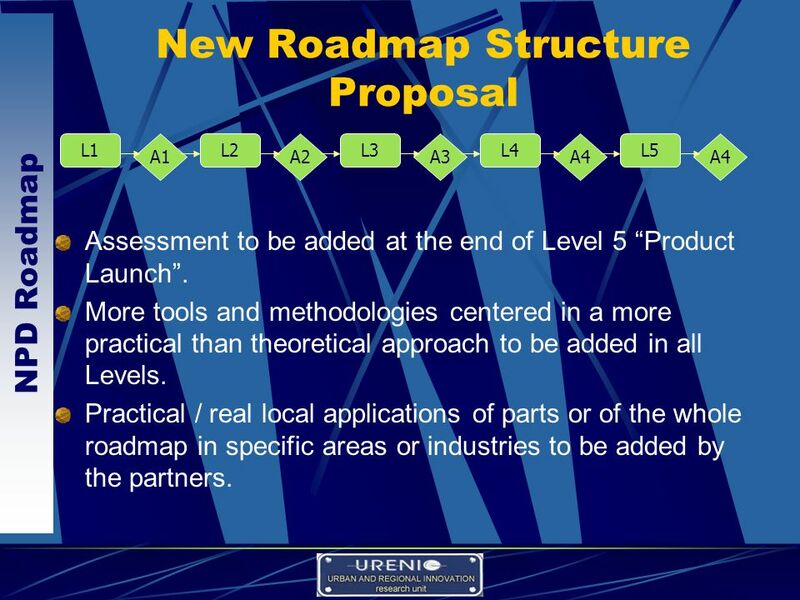 All existing Assessments plus the one that will be added at the end of Level 5 will be altered so that they can reflect and represent the new Roadmap structure. 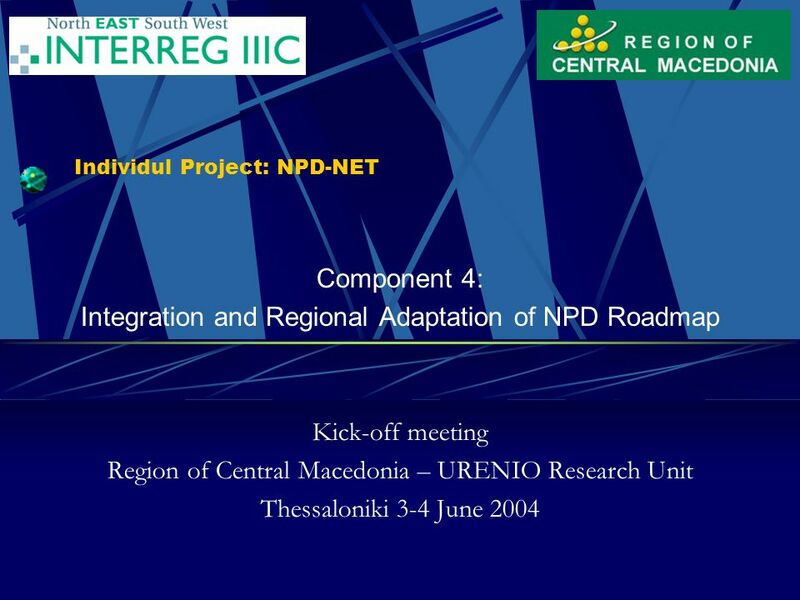 Download ppt "Individul Project: NPD-NET Component 4: Integration and Regional Adaptation of NPD Roadmap Kick-off meeting Region of Central Macedonia – URENIO Research." MATLS 4Z06 Industrial Projects MSE Capstone Course Joey Kish (Coordinator) Monday, April 29, 2013. Intuitive Design Inc. New Product Development Progress March 25, 2006 Prepared for: Company Management Team Dave Leis. New Product and Service Development March 2007 PB. Project Title GIST [City, Country] [Month, Year] Team/Company Name Pitch Presentation Template CRDF Global – The GIST Initiative. LR NYU Fall 2007 Business Operations New Product Development Process. Global Procurement Solutions (GPS) Manager of Business Development Final Project, Fall semester December 16, 2000. © 2002 Pearson Education Canada Inc. 9-1 MGT330F – October 29, 2003 Review of upcoming ‘deliverables’ Marketing in the News Group Presentations: “Landmark. SUMMER 2005 JUNE Building the ERP Business Case. © 2002 Pearson Education Canada Inc. 9-1 principles of MARKETING Chapter 9 New Product Development and Life Cycle Strategies. Marketing Research Ch. 28 ME. Marketing Information Systems Section 28.1. 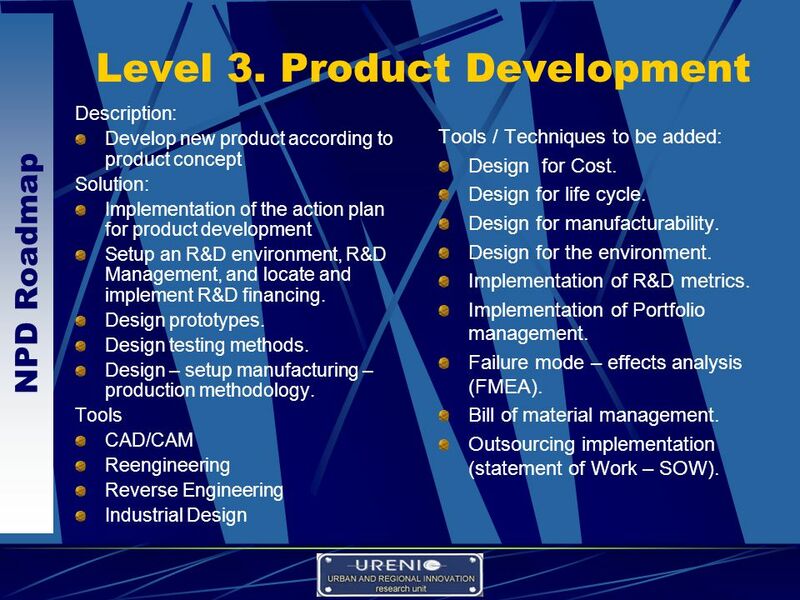 New Product Development (NPD) New product to grow market share or within overall strategic process of product life cycle Operations Management 8 Stages. New Product and Service Development DG 10/23/05. Table of Content  Objective  Company Background  Vision, Mission & Goal  New Product Proposition.